Spanish website espabox.com writes that Ruben Varon has pulled out for the fight against EBU superwelter champ Jack Culcay. 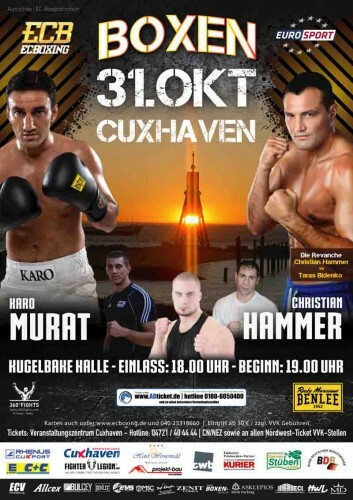 Culcay vs Varon was on for Sauerland´s big show in Oldenburg (December 6). Varon suffers from an infection to a nerve in his right eye and needs to rest. This was to have been a voluntary defence by "Golden" Jack. Both Sauerland Promotion’s website and French websites confirms that Mateusz Masternak (33-2) take on former world cruiser champ and heavyweight contender Jean Marc Mormeck (37-5) December 5 in Issy les Molinueaux (France).The 42-year old Mormeck returned to the ring this year and went back to cruiser after campaigning as a heavyweight 2009-2012. Mormeck was stopped by Wladimir Klitschko after a poor performance in 2012. Reigning German heavyweight champion Michael Wallisch (13-0) take on Croatian journeyman Ivica Perkovic (20-24) in an eight-rounder on the undercard to Klitschko vs Pulev November 15 in Hamburg. Perkovic is also booked to fight Swedish heavy Otto Wallin November 29 in Copenhagen. De Carolis won the vacant IBF I/C title on scores of 115-111, 115-112 and 115-113. Cordoba won the Spanish cruiserweight title. Lindberg retained the WIBA, WIBF and GBU titles when Vujuc took a right, sat down and it was stopped in what appeared to be a dive even though she got a headbutt after Lindberg had scored with the right - or heads clashed - but neither looked hard enough to cause a ko. "The matter is "under investigation" - and word tonight (Nov 5) is that the official result is TKO 1 win for Lindberg! Lamiri retained the EU bantamweight title flooring the challenger with a right hook, Azaouagh got up but was under heavy pressure when it was called off. It was scored 57-57 and 57-56 for Azaouagh after six. 120-107, 120-108 twice, non title. Hammer paced himself carefully against a slow, plodding opponent who looked powerful but seldom punched. Costa defended well and Hammer looked content to win and put on a workmanlike performance. Tchoula accepted the fight at the venue after Varol Vekiloglu was cut (!) on the way to the hall after some problems with some guys he walked into ... true or not he didn´t show up and to save one of the main events Tchoula was elevated to a ten rounder and was out of his league, performed bravely but was outsclassed and stopped in the fourth. Murat mixed his attack well topping his combinations with a fine left hook to the body. Williams showed no punch resistance at all and looked out of it from the beginning. He was floored in the first, saved by the bell and when floored again early in the second his cornerman waved the towel. 60-54 on all cards in a fight where Velecky was outboxed, bleeding from the nose but kept coming. Lessmann came in on what must have been less than two hours notice but did well. Fornling was very agressive but not overly effective as he got too close to his opponent. 40-36 twice and 39-37. Fornling was cut over the right eye but it didn´t require any stitching. Cezar made his prodebut and won a close points win over Horak, a southpaw with an awkward style. It was scored 39-37, 40-36 and 39-39. Angermann came in at a very late notice and there were no weights for either boxer. Maudodi dominated the action and won on scores of 40-36 on all cards. Potjomkins walked into a solid right and went down in delayed effect, got up but was counted out standing. 98-92, 99-91 and 96-94, WBFed female supermiddleweight title. Major floored, got up but was stopped as Kanales followed up. Tommasone won the vacant Italian featherweight title on scores of 96-93, 96-95 and 95-95. Mendy retained the French lightweight title on scores of 96-93, 97-93 and 97-95. Osipenko was down in the second and third.